Soft, Smooth, Hypoallergenic, No Chemicals, and Dust-Free. MYK Silk's pillowcases are made of Top Grade 6A Mulberry Silk. Weight is 19 momme, 22 momme, or 25 momme. All pillowcases are made with certified non-toxic dyes. Silk is long fiber, so it is difficult to generate dust. It is naturally hypoallergenic and breathable, cool in summer, warm in winter, helps regulate body temperatures - ensuring best sleep possible. Benefits for your hair, skin and sleep patterns. Natural silk pillow is great for all hair types and textures. It prevents friction, breakage, frizz, and bed head. Silk's long fiber and gentleness helps preventing dryness of skin through out the night. Perfect beauty pillowcases for spa, hotel, salons, gifts, and travelling. You'll wake with smooth hair, radiant skin that only comes from a good night's sleep! You can add a few drops of hair conditioner to the rinse water to keep the silk soft and flexible. Hand wash in cold water with mild detergent / air dry recommended. Machine Wash only on most gentle cycle. MYK Silk is a newly established brand specializing in offering 100% pure mulberry silk products. 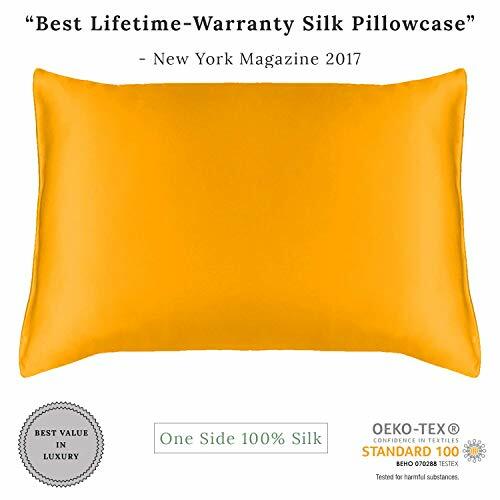 With our self-owned manufacturer and headquarter in New York City whose silk manufacturing experience is more than 20 years, MYK is dedicated to offer a solution: high quality silk with affordable price. MYK developed A formula with advanced technique, efficient cost control and a great passion for silk that makes silk accessible to everyone. If you have any questions about this product by MYK, contact us by completing and submitting the form below. If you are looking for a specif part number, please include it with your message.